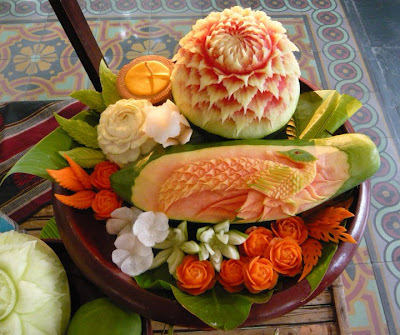 Continuing on our efforts to try our hand at Vegetable and Fruit carvings, the gift from Nitda Phongcharern along with the Carving set was a welcome boost to our tryst with Carving. 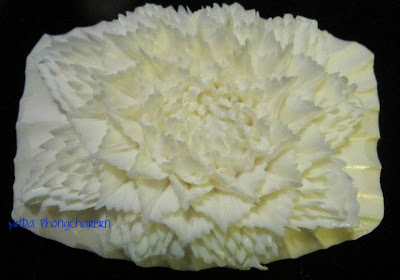 Last time I had exhibited one of our first carving efforts with a simple Kitchen knife, which is seen below. 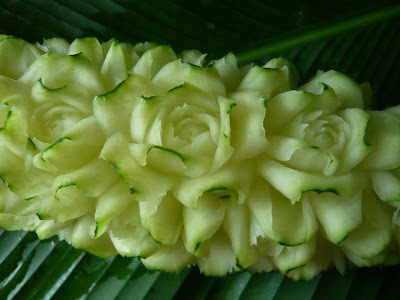 Very simple, or rather amateurish carving but it was a first step into this wonderful art. My daughter Mansi was not only overjoyed at receiving the set but got ready to start her first carving display. Though she had done some wondrful small Tomato and Carrot carvings earlier with the simple kitchen knife, which unfortunately I could not photograph, she tried her had at some simple sliced carrot and cucumber carvings which she has displayed in a plate. 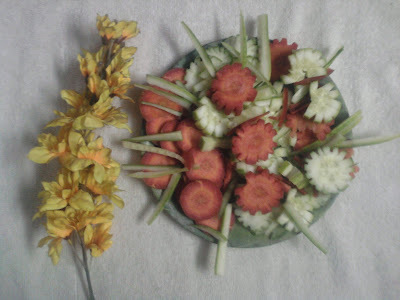 The cored remnants of both the carrot and cucumber have also been used as simple garnishing to compliment the colors. I know again this is a very amateurish carving but for a 13 year old to take up this art only after reading my blog and being motivated by the wonderful artists I portray on my blog is commendable. 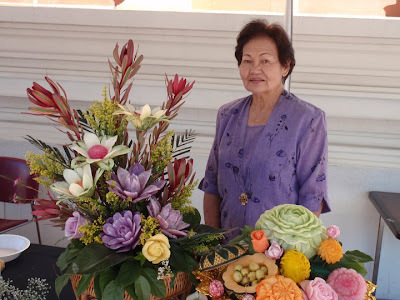 I am sure she will learn from experience, as she has been watching the "Traditional Thai Fruit and Vegetable Carving" video CD by Sumalee Murphy over and over again, and I am sure she will come out with some wonders. I too will be trying my hand at carving as soon as I get time off from my busy schedule, so here are the two photographs of the Carrot and Cucumber sliced carvings Mansi made today. 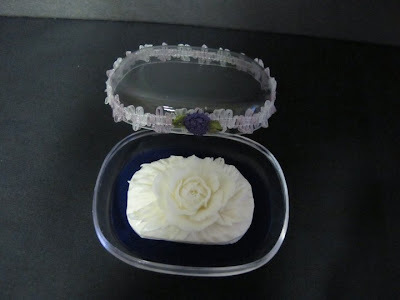 Both are the same plate,one only with a dash of flowers to brighten up the display! Hope you all like it. Will be back with some really good carvings as we are planning for a bigger Carving session either tomorrow or on Sunday being a weekly holiday for her from school. So enjoy! This is the first carving we had made with our simple kitchen knife set which was already displayed in my previous post. 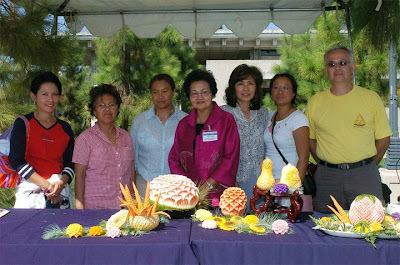 This was a simple Tomato, Cucumber Radish, and Spring Onion Carving display! 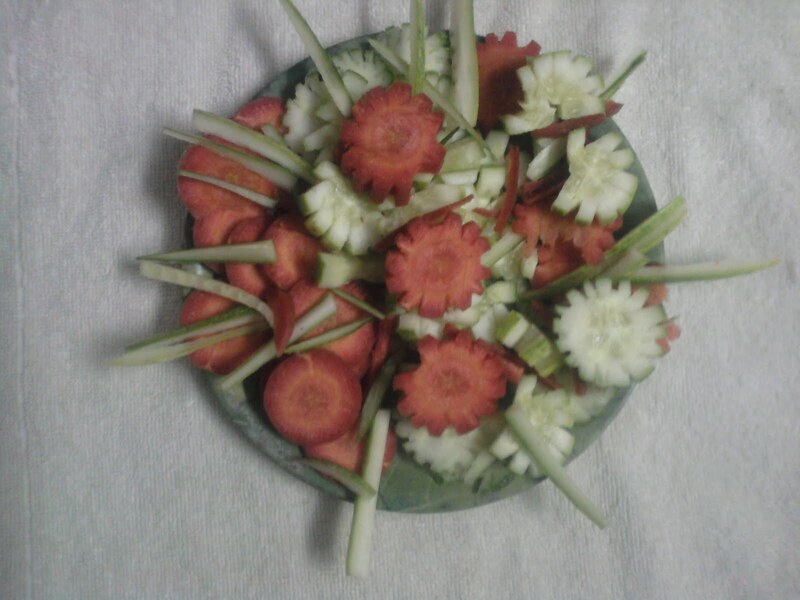 What you see below are Simple Carrot and Cucumber Sliced Carvings Display by my Daughter Mansi. 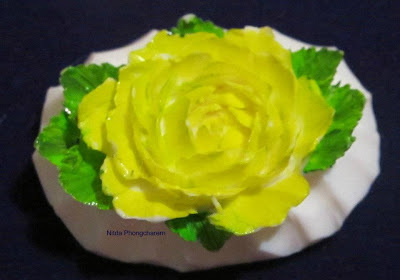 The same plate has been photographed with a Floral display just to add color! 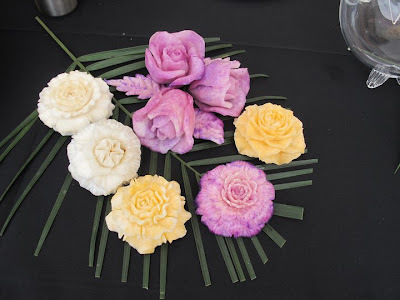 This was done only to highlight to her the effect simple floral or even additional display can have on the overall display of your Carvings. Every detail is important! 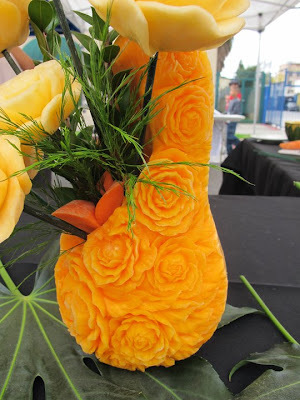 Friends, Proffesionals and experienced Vegetable Fruit Carvings please excuse our first efforts and I am sure we will come up with some mind boggling carvings in our next post! All this credit goes to the motivation you wonderful artists give us through your work! Thank you! I take this opportunity to Thank all my Friends, Readers and Patrons for reading, subscribing to my Blog, and constantly motivating me to do better. 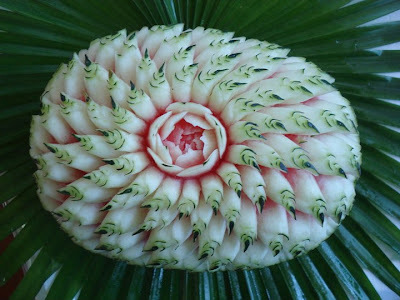 As you are all aware I have been posting about various wonderful Fruit and Vegetable Carving Artists all over the world and on Facebook as well, trying to display their work, their skills, courses if any and I do this unconditionally out of my own liking for this art. 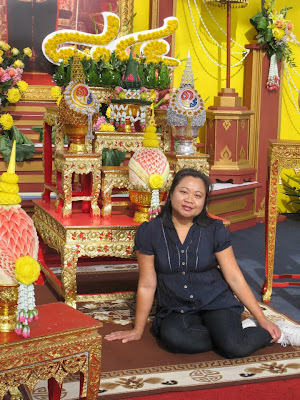 I have always enjoyed the arts and carving came to me naturally though I did not practise it at home. 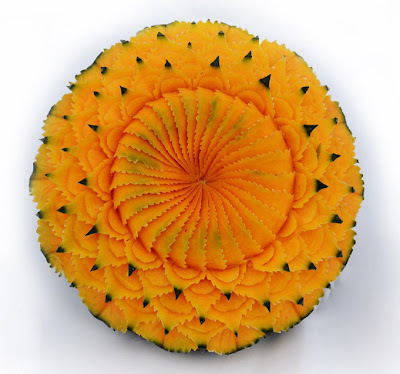 I used a simple home knife to do the carvings and kept experimenting on various Vegetables, but never took it seriously. Nor did I photograph the works so I could dislplay them to others. 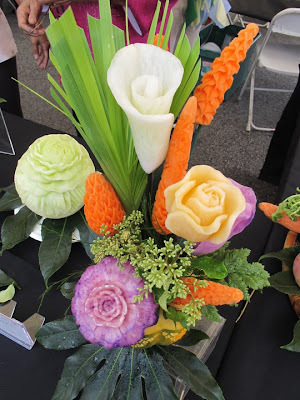 However recently I have taken more interest and even have one of my simple Vegetable Carving Displays shown below. 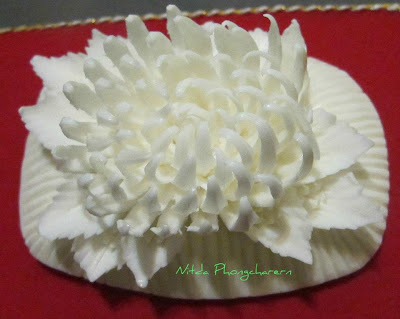 My intention to display the work of other Artists on my blog was to not only getting to know more about these artists and their art, but also readers who scan the web for various information could not get most of it on one Blog. To some extent I feel I have succeeded, and I will endeavour to do my best. 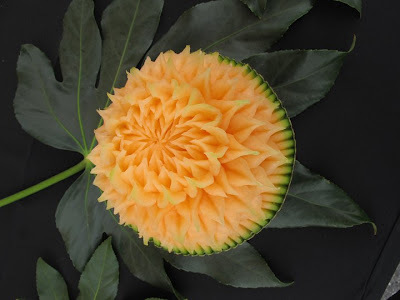 Due to my work I not only befriended so many wonderful artists on Facebook and other Social Networks that I was happily shocked how much this subject of Carving is liked by thousands of people. 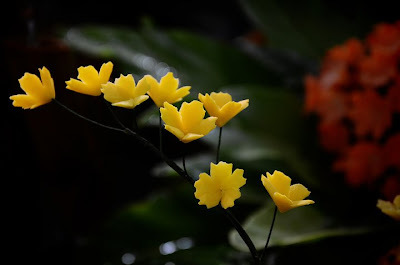 As you will see my Blog has crossed the 200,000 visitors mark at the time of sharing this post, for which I once again thank all my visitiors, patrons and subscribers. During this most of the Artists who I wrote about appreciated my efforts and there are many more about whom I have created write-ups but will require some time to publish the works. 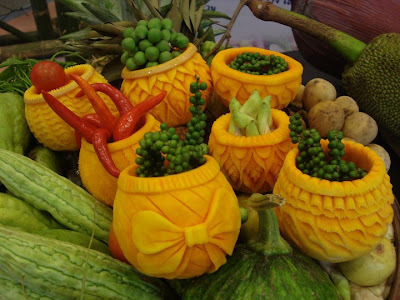 Recently I had posted a few details about Vegetable Carvings and other Carving work done by Nitda Phongcharern. As most Artists do she too appreciated my work and furthermore surprised me when she said that she had sent me a Gift as a mark of appreciation for my posting about her work and her Classes on my Blog. This was most unexpected all the more undesired. When asked what was the reason for the gift as I never expected anything in return! 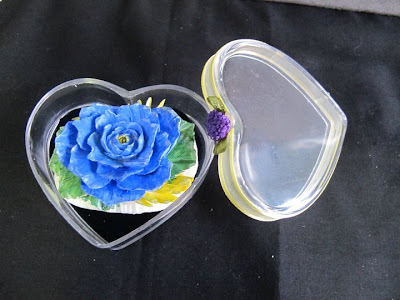 Pat was her reply - "Because you are my friend and it is very hard to find a nice person like you and you do thing for other people from your kindness heart and I hope you like it." - I think this is my biggest present from any one. What more could I ask than for appreciation and realization from a person that I have done this only from my heart unconditionally as a true friend though we have never met and stay Miles and Continents apart! Today I received her present and like I said though her appreciation of my work was worth more than her Gift it will remain as a Token of her appreciation, and remind me that there are so many friends that really like me and my work from the bottom of their heart! I take this opportunity to portray the Gift I received not as a commodity for display but my sincere appreciation towards Nitda for her kind gesture. Yes the Gift contained a wonderful DVD on Vegetable and Fruit Carving by Sumalee Murphy, a wonderful Veg and Fruit Carving Tools set and a Cute little Christmas Greeting! Thank you so much Nitda for your kind Gesture. I will cherish this gift very much, and now you can look forward to some great displays of Veg and Fruit Carvings from me myself, very soon - thanks to the Tool Set she has sent! 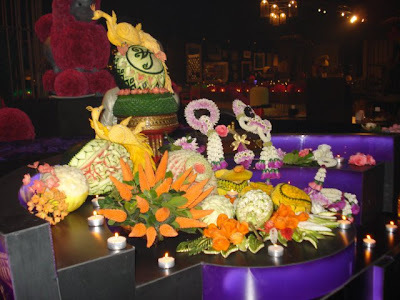 I have also displayed a very simple and possibly one of my first Veg Carving Displays which me and My Daughter Mansi did together and luckily had photographed, for all of you to see. I will now photograph all my works and try to display them whenever I do so! Here is the wonderful Gift I received from Nitda Phongcharern! This is a close-up of the DVD and the Carving set. 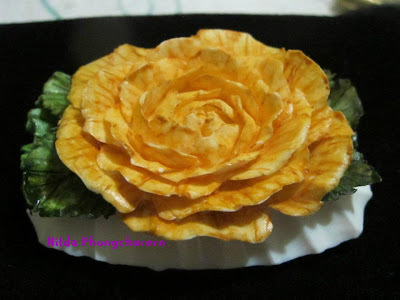 Here I have posted the first set of Vegetable Carving displays I and my daughter Mansi (15 years old) did for a small Family Get together we had at home! 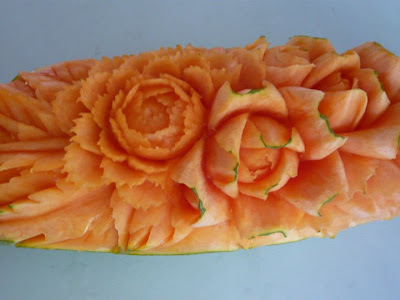 This was a simple carving of Tomatoes, Radish,Cucumber and Spring Onions I did with a simple Kitchen Knife so all you wonderful and Proffesional Artists please excuse me for the crude carving! I assure you that you are all in for some great surprises! 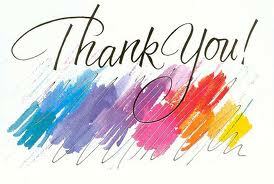 It is all the motivation that I have received from all you wonderful Artists, please while I expressly thanked Nitda for the Gift I extend my sincere thanks and appreciation to all Artist who have been a source of inspiration behind this Blog! Please remember that your love, appreciation, guidance and motivation is my Biggest Gift! 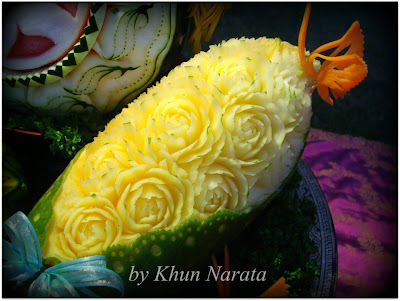 Continuing on my efforts to portray the work of Established and growing Fruit, Vegetable and Soap carving artists from all over the work on my blog, today I take this opportunity to bring to you this wonderful Artist Khun Narata and her work to you all. 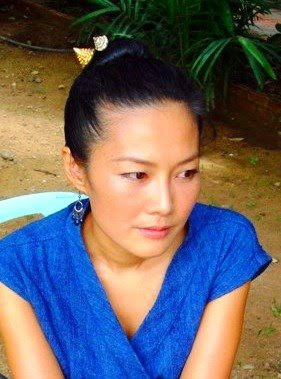 This multi-faceted artist is aTeacher, Regional Marketing at International Carving Association, KIWI & KOM - KOM PRODUCTS CO.,LTD. 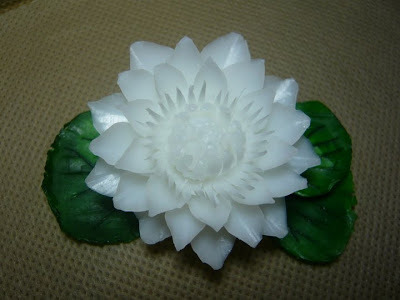 In this Post I will highlight some of her exquisite work of Carvings in Vegetables, Fruits, and Soap Carving. 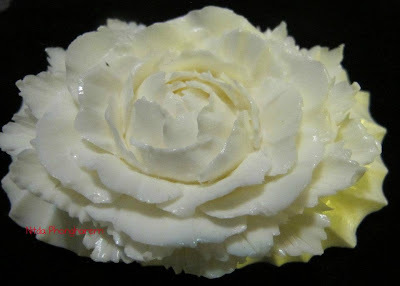 I am sure all Carving enthusiasts know her well enough on Facebook, but this is my effort to bring to the public some of her best works on one page. 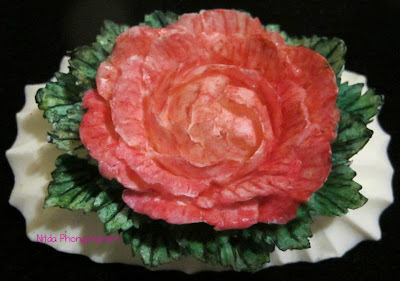 There is a lot more you can see about her Carving Skills at her Profile page on Facebook. 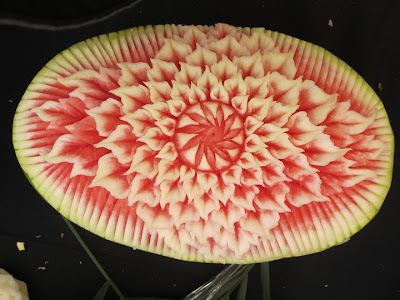 I leave you now to enjoy some of her wonderful work of carving, as I will first portray some of her fruit carvings, carving displays, and soap carvings here. 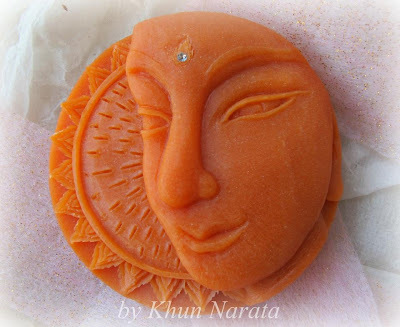 I have posted only some of her best carvings which I liked and also given the direct link of that respective album on the heading and the images so you can enjoy the innumerable work of art she has created at your leisure! 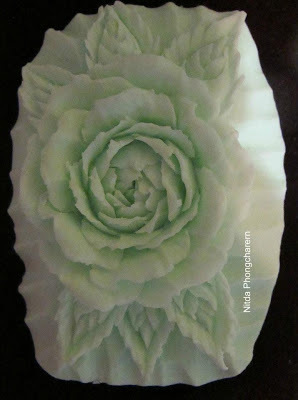 There is so much this Artist churns out every now and then and yet you don't tire watching her exquisite carving work. 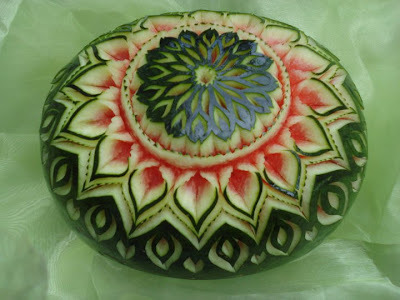 It is such artits that keep this fine Art of Vegetable and Fruit Carving alive. I wish her all the best in her work and we look forward to watching her give us more such wonderful work to watch and get inspired! 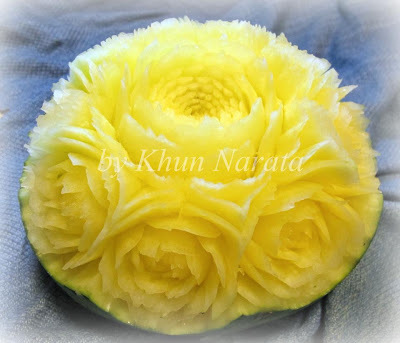 All the Kest Khun Narata! 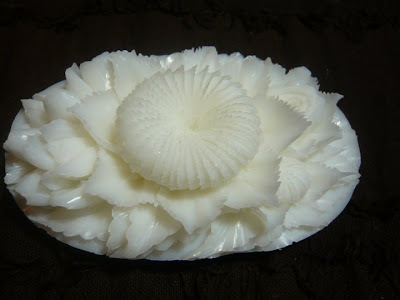 In my next post I will give more information about some wonderful carving tools she has for sale. Behind every good artist there is always a good teacher, yet few artists would take this opportunity to thank their teachers for what they have learnt from them. It is your respect for your Teacher, and their art that takes you places, as they are always there to bless you and feel proud of your work as much as you will when one of your students comes out with a fantastic creation and you proudly say - "This is my student". 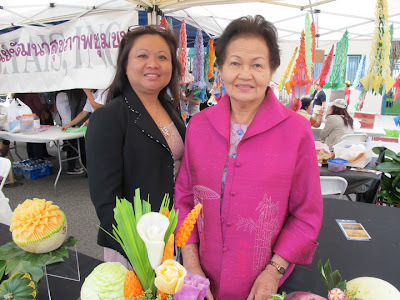 Here you will see some of Nitda Phongcharern's work of carving which she has dedicated with pride to her Teacher, and obviously so! It is her humbleness and simplicity that makes her portray the work of her Teacher and herself in a separate Album. I am sure Nitda's Teacher will be feeling as proud of her student as we are! Keep it up Nitda, it is the Blessings and Greatness of your Teacher that are now seen in your work and we are sure that you will keep us inspired with more of your great work! Do convey our Respects and Regards to your Teacher! Here are a few of her great work Images and also you could see more of her work at her profile and her albums. 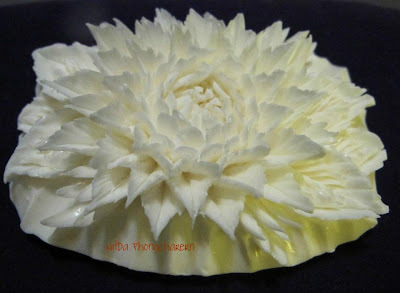 Some great images of Carving work Portrayed by Nitda in her Album which I liked and wanted to share! These are some of her works at the New Year Show at Thai Town on 4/3/11. 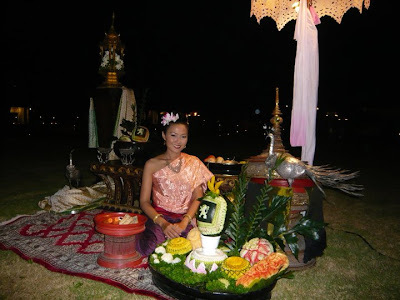 Here is Nitda at the King of Thailand's Birthday 2011 event! Proud of you and your work! 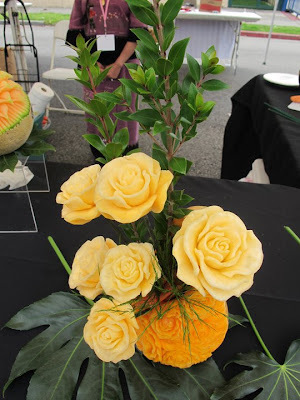 I have always been imspired by the work of so many Fruit and Vegetable Carving Artists on Facebook, and tried to portray their work in my blog. 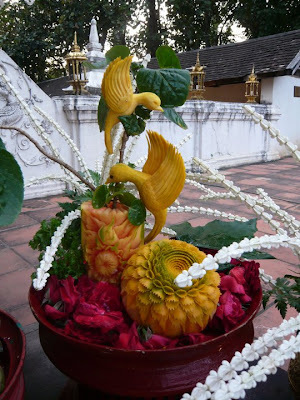 Here once again is a series of fantastic carvings by my favorite artist Amazing Carvings by Nitda Phongcharern. 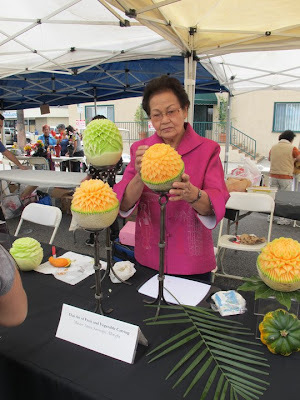 Once in every few days she brings out some classic carvings both in Vegetable and Fruit carvings as well as Soap carvings. 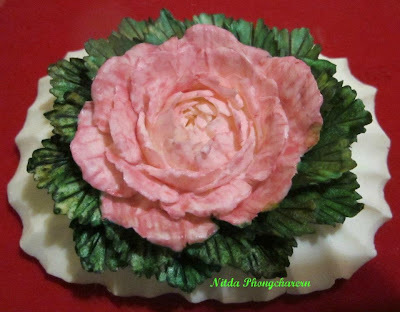 Here I have only taken some of her best soap carvings which she has posted recently in her album so that all of you Fruit, Vegetable and Soap Carving enthusiasts can take a look at her fantastic work. 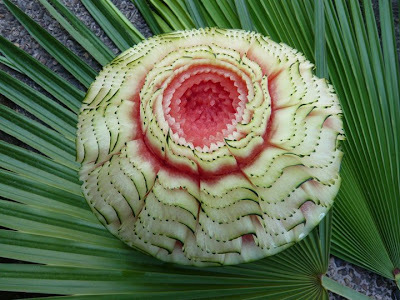 I don't need to comment on her art as the work speaks clearly for a lot of dedication and love for her art, along with painstaking skill that goes into each carving! 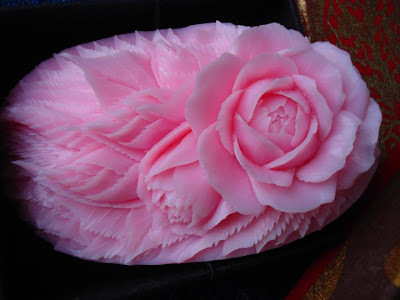 I am sure along with me there will be a lot of other Carving enthusiasts who will get together with me in thanking her and congratulating her on her great work. Keep inspiring us with more of your work Nitda! 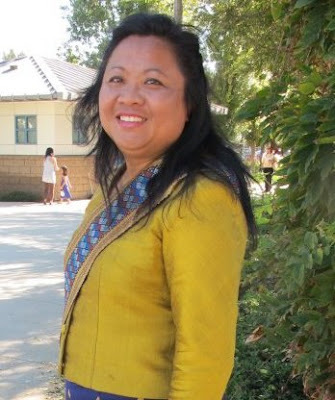 Those who want to take a look at her other work may catch her at her Facebook Profile.. I leave it to you to enjoy her work of art! 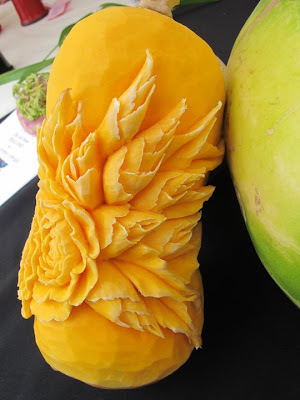 My next post portrays some of her best Vegetable and Fruit Carvings!